Scotty Tris: Race Preview - Let's get a little Goofy! I'm marking off another bucket list item this season. I completed a 50k and up next is the Goofy Challenge Race and a Half Race. I'm also throwing in the 5k to make this the unofficial "Dopey" Challenge. 4 medals and 4 race shirts in one weekend? Good thing we are flying Southwest because I'm going to need extra luggage. 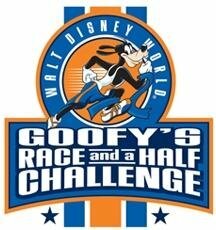 For those who don't know, the Goofy Challenge is running a half marathon through the Magic Kingdom and Epcot on Saturday and then a full marathon the next day through the Disney World resort. I'll also be running the 5k with TKB on Friday to get the leg juices going. Since I really had no specific goals, the training for this was to simply keep my base up and do what I could through the holidays. I managed to log 134 miles in December, which is the most miles since September. October included a marathon and November included the 50K, so pretty decent. 5K - Run with TKB and have fun! Since our paces are so different, I typically don't run with TKB when I'm racing. Since this is a family fun run, I'm going to do just that! Half Marathon - PR. My PR is 1:45:51. This should be pretty easy with how well my training is going for the distances in the 10 - 15 miles range. I've PR'ed my half marathon time on many of my training runs in the last month. I'm planning to pull the Chicago Marathon playbook out and match the pace for the first 13 miles of Chicago. I do want to be somewhat smart about it because I do have 26.2 miles to run the next day. Full Marathon - Running with Joe VI and have fun. I haven't provided any more costume previews because we still have items to purchase and fabricate. I'll post a photo next week. So that's essentially it! It's going to be a great time because the entire Jeppson clan will be there, as well as Jake & Rebecca, and I'll be meeting up with a long distance friend for the first time who I know through work, Jill! This should close out my 2012 season (yes, I know.. it's actually 2013). Unless I get a free bid for the Groundhog Run, it may be March before I race again and that will be a 4 mile race. It's time to bring the bike and swimming back into focus.... maybe some iron pumpin'!